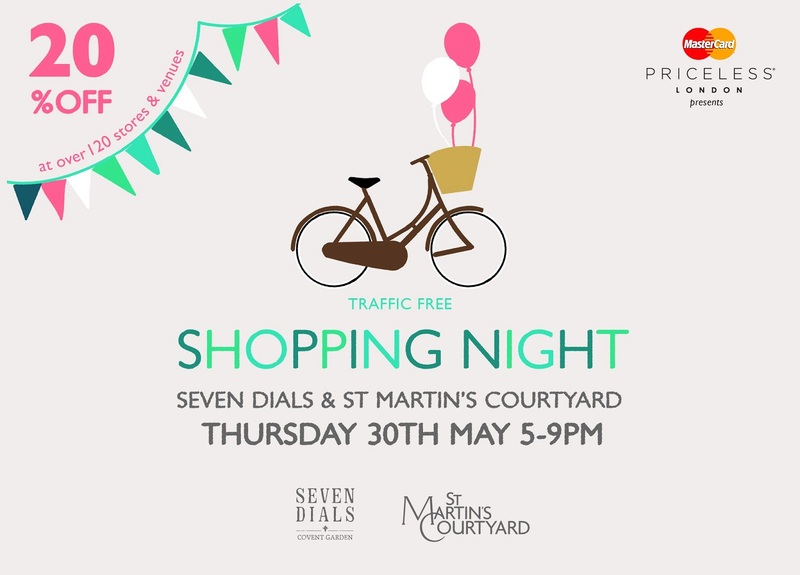 "London foodies, head to the Seven Dials & St Martin’s this Thursday between 5-9pm, as for the first time ever, Seven Dials welcomes a handpicked selection of London street food stalls and decadent pop-up drink bars for shoppers to enjoy exclusively for the Shopping Night. Head to Shorts Gardens and enjoy British savoury delights for £5 or less from street vendors What The Dickens! and Eat My Pies alongside The Cocktail Gardener, Lottie Muir of Midnight Apothecary fame, who will be creating seasonal wild garden cocktails using cultivated herbs and flowers, including an exclusive ‘Seven Dials’ cocktail for £5. Plus, the Twisted Ice Cream Cocktail Parlour where you can indulge on the world-first alcoholic ice cream and home-made "hard" lemonade. Over on Earlham Street, Kamm & Sons BarCycle and Punch & Judy Bar will be serving a mixture of delicious Summer punch and Sunshine Mary’s made from their British Aperitif plus Ruby Violet the classic Bedford ice cream van will be offering a delicious selection of ice cream flavours including chilli chocolate, English rhubarb & custard and liquorice & blackcurrant, from £2.50 a scoop. Wildwood Kitchen and Kopapa on Monmouth Street are also reclaiming the streets with their pop-up food stalls serving exclusive menus for the night, while Diesel on Neal Street welcomes Big Apple Hot Dogs to its store to satisfy hungry shoppers. 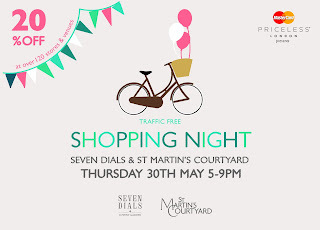 In neighbouring St Martin’s Courtyard show your exclusive shopping night ticket and claim complimentary BLOOM Gin cocktails from the St Martin’s Courtyard pop-up bar, or enjoy signature dishes from resident eateries Jamie’s Italian and Suda at their pop-up food stalls. As well as this, expect 20% off at over 120 stores across the areas, plus in-store entertainment, live music, performances, giveaways, photo booths and much more."